Patrick at Mysterious Galaxy in San Diego is my connection for good fantasy and good science fiction. (He posts reviews here.) This year he got me hooked on military sf, space operas, the kind of novels that span light years as well as decades, where fates of galactic empires hang in the balance and it all comes down to the decisions of one man or woman in the captain’s chair of a space carrier facing impossible odds. The battles rage up and down solar systems and in and out of hyperspace and even if you’re a card-carrying pacifiist you can’t help but thrill to the might and majesty of it all. In Jack Campbell’s Lost Fleet series beginning with Dauntless, a war has been raging between the Syndic and the Alliance for more than a century, and in a perfidious bit of treachery the Syndic has killed the Alliance fleet’s combat officers. Ah, but then the Alliance rescues Captain Black Jack Geary from the cryopod he’s been adrift in ever since the last battle he fought a hundred years before. Since, after they wake him up, he’s the most senior officer in the fleet, he takes command, and over six novels leads the lost Alliance fleet home. John Scalzi’s Old Man’s War is the direct descendant of Robert A. Heinlein’s Starship Troopers and Joe Haldeman’s The Forever War. At age 75 John Perry leaves earth to join the Colonial Defense Force. In return for a new young body, one specially upgraded for battle, John and his peers will fight the alien races who are in competition with the CDF for new planets to colonize. John’s got a smart mouth and a grunt’s-eye view and he is very good company through a plot that just keeps throwing new stuff at you, and then throws some more. A must read. 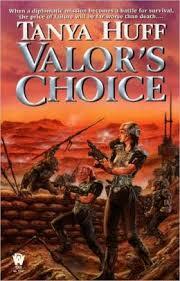 Right now I’m tearing through David Weber’s Honor Harrington series like a dreadnought through n-space. Think Horatio Hornblower with Pip for a pet. 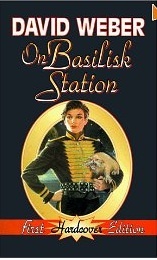 In On Basilisk Station, the first of this now 12-novel series, Captain Honor Harrington, Royal Manticore Navy, and her ship Fearless are assigned to picket the galactic transfer port Basilisk. Smart, principled, courageous, the aptly-named Honor cleans up the mess left behind by the last captain, including but not limited to a planetary insurrection and an enemy invasion. 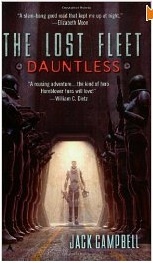 The characters are great, the plots brobdingnagian, but the detail of the setting is these novels’ greatest strength. You feel like you’re one of Honor’s crew and you will both cheer and cower during the battle scenes. And THEN I discovered Tanya Huff’s Valor series all by myself. Confederation Space Marine Master Sergeant Torin Kerr battles her way across the galaxy, in spite of a novel-to-novel realization that the war the Confederation is fighting is not anything like it seems. I won’t spoil it, but these books, five so far and I hope there will be more, are funny, smart, and real enough to smell the powder. You get the feeling that real marines talk and act and fight just like this (okay, absent the aliens), and the books might just give you the warm fuzzies that people like Torin stand between us and threat every day. If you really like a space opera, try “Startide Rising” by David Brin. Great plotting and characterization and a truly distinctive setting. Try Elizabeth Moon next! Her series with Heris Serrano is awesome, start with Hunting Party. Don’t forget to try Tanya Huff’s Valor series. @MaryC — Already read ’em, and agreed! @Dina, Bud — now on my to-read list, and thanks! There are two spin offs to the Honor series, just about to start reading them. Two sets of two books. Would mention them but it depends what book you are up to. Now I have to go back the Sword Of Truth series, so I can start, and Finish the Song of Fire and Ice series before the TV series starts. Don’t forget Lois McMaster Bujold’s Vorkosigan Series, or David Drake’s Mundy and Leary saga, or my personal favorites, John Ringo’s Hot Gate series that starts with Live Free or Die! I also liked the Temeraire series by Naomi Novik. Napolenic sea epic with dragons. 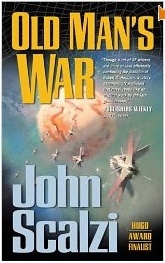 I loved Old Mans War, but for me, Scalzi is hit and miss. Sometimes he’s brilliant, but at times, for me, he’s virtually unreadable. All good choices. Add Lee & Miller’s Liaden series to your reading list. Already read Lee & Miller, Steven, but would you call Korval military? Love Novik’s Napoleonic dragon series, Barb. Big fan of Miles, Cedar, but I’ll give the Hot Gate series a try, and thanks! If you like the Honorverse, Goodreads has a group that worships her. Tanya Huff and Elizabeth Moon are the best in this sub-genre. Torin is the best! Serrano is straight military. The Marque and Reprisal series is more intrigue than military, similar to Liaden but more intense. I found Liaden to be almost YA. For me Scalzi is another Heinlein derivative. Well written, but nothing much new here. Elizabeth Bear and Kristine Smith and Ava Grey will keep you intrigued. Not strictly military, but lots of conflicts. Steve Perry’s Matador series (The Man Who Never Missed) is fun, in a Harry Harrison way (Stainless Steel Rat). And saving the best for last: CJ Cherryh writes the most complete world-building scifi around. Start with Foreigner if you like political intrigue (push through the prologue), Downbelow Station and Cyteen are classic, and the Chanur adventures are told from the non-human perspective, which is unique. I should also have mentioned John Ringo and David Weber’s Empire of Man series, March Upcountry, March to the Sea, March to the Stars, and We Few. A series of pitched battles and great alien characters, would make a great film franchise.